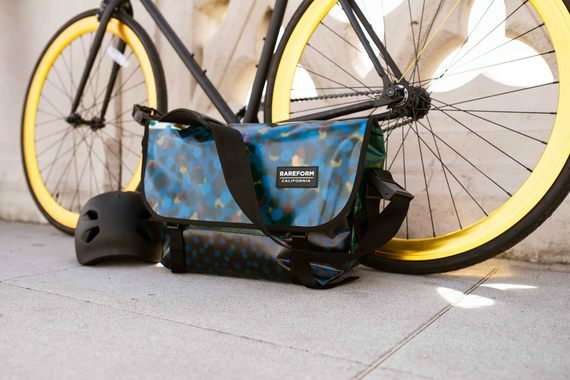 When I first heard about Rareform, the California-based company that repurposes billboards into bags and accessories, I thought it was a pretty amazing idea. So, apparently, did Milton Glaser. The legendary graphic designer -- who created the iconic psychedelic Bob Dylan-in-profile poster, AMC's "Mad Men" logo, and the ubiquitous "I ♥ NY" logo among dozens of other iconic designs -- is the first artist to partner with Rareform's new Art Lives campaign. Rareform "approached me. They'd seen 'It's Not Warming It's Dying' ... They called and said they had this program where they cut (billboards) up, which sounded like a crazy idea. I liked it," Glaser told me. Glaser's "It's Not Warming It's Dying" design -- referring, of course, to global warming -- was aimed, Glaser said, to raise "an awareness that this horrible thing was happening; it was appeal to public consciousness. The sense that we're all in this together, and someone has to pay attention." Last fall, Rareform and Lamar Advertising teamed up with the world-renowned graphic artist to replace an ad with his artwork. 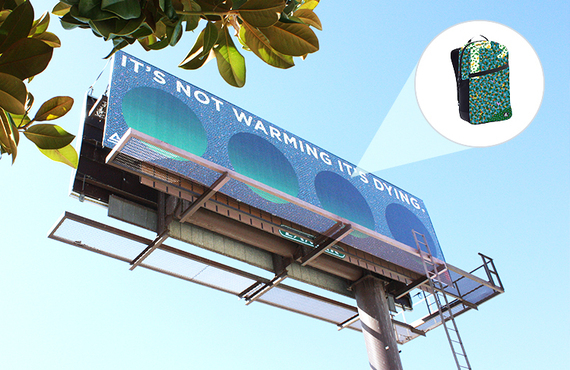 Lamar installed Glaser's "It's Not Warming It's Dying" design on an LA billboard. 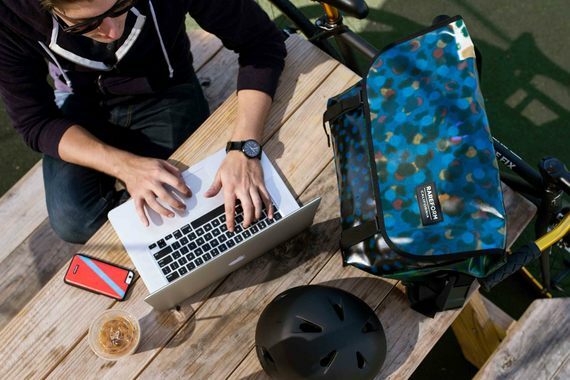 When it came down, Rareform upcycled the massive vinyl billboard into some 100 backpacks, messenger bags, iPhone cases, even pins, so as to use every last scrap. Founded in 2012, Rareform is a sustainable outdoor gear and lifestyle brand committed to creating goods made from upcycled billboards. Typically, Rareform intercepts billboards before they reach the landfill. Each billboard is made of heavy-duty, water-proof, mildew-proof vinyl. They recycle the billboards to create anything from surfboard bags to backpacks, iPhone cases to wallets, messenger bags to iPad sleeves. "One of the most common questions customers ask us is 'What is the story behind my bag?' They want to know what ad was on the billboard, where the billboard was located, etc. Unfortunately, we don't always know the answer," Rareform Founder Alec Avedissian told me. 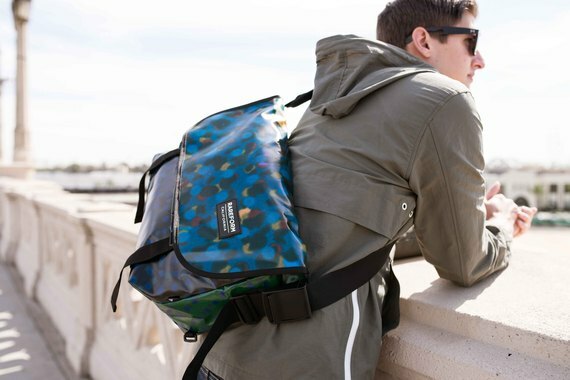 Thus the limited-edition Art Lives lines will be "a special way to let customers know exactly where their bag came from--the story behind their bag," he said. "Also, it gives customers a chance to own a piece of wearable art at a price-point that's more accessible to the general public." "We wanted to go after somebody who was respected by all age groups. Milton is known as the 'godfather of graphic art," Avedissian said. "We liked how his art had a recognizable pop to it. The billboard artwork he's designed is everything we like: bold, daring, and tells a story." Of course, "It's Not Warming It's Dying" shares Rareform's ethos. A typical billboard is 14' high and 48' wide -- a lot of landfill waste. "We could get around 200 backpacks from one billboard if we had 100 percent yield," Avedissian said. Rareform has also joined Patagonia's 1% for the Planet campaign. Born in 1929, Glaser has had one-man shows at the Museum of Modern Art and the Georges Pompidou Center. He was selected for the lifetime achievement award of the Cooper Hewitt National Design Museum (2004) and the Fulbright Association (2011.) He became the first graphic designer to receive the National Medal of the Arts award in 2009. As a Fulbright scholar, Glaser studied with painter Giorgio Morandi in Bologna. He co-founded New York Magazine in 1968, He opened Milton Glaser, Inc. in 1974. Glaser's work is so ubiquitous you may not realize you're even taking it in--his client roster includes Esquire, Columbia Records, Brooklyn Brewery, New York Magazine and Penguin Press, among dozens of others. Today, Glaser gets requests to build brand identities from all over. So how does one of the world's most known graphic designer choose what projects he'll take on? "If I'll enjoy doing it, and if it causes no harm," Glaser told me. "What I first do is try to find out objectively about the facts. Then I forget them and do what my intuition tells me," he told me. I asked Glaser why he thought "I ♥ NY" had such incredible success. "It was authentic. It wasn't an ad line. It had a sense of authenticity that advertising doesn't have," he said. "Because of that initial energy, it became so evasive, (but) I don't think you could figure out why that took off." Next up in Rareform's Art Lives campaign is artist Tyler Ramsey, best known for his work with TOMs shoes. That line is currently underway. "We like him because he is unique, bold, and willing to take risks in his artistry," Avedissian said. Lauren Daley is a freelance writer, book columnist, and music columnist.